The Paravent, designed by Christophe Marchand is a free-standing room divider made of form pressed felt slats. Fibers made of recycled plastic bottles are pressed into 12 mm thick sheets of massive felt. After the pressing, each slat is cut out by waterjet. In the last step of production, the slats are connected through the use of a 3 mm cord. The combination of industrial production and manual labour are clearly visible in the precise shape of the pressed slats and the connetion cord which has been threaded by hand . The Paravent is available in light grey and anthracite and both colours come in 2 sizes. P130 is 1300 mm high and the large model P180 has a height of 1800 mm. Apart from being a flexible room divider, the product also has acoustic properties. 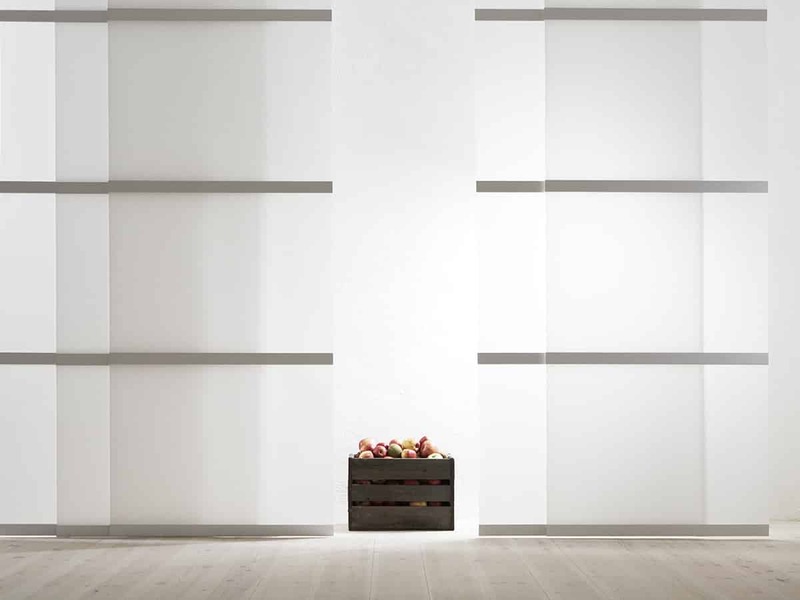 The Paravent is placed free-standing on the floor and can be shaped in any desired formation. The soft surface makes it suitable for use on all kinds of floors without causing scratches. When needed, the Paravent can easily be folded and stowed. Due to its light weight, it is also easy to transport. A mobile piece of furniture for variable division and creation of interior space.